Below, David Luttenberger, Global Packaging Director at Mintel, discusses these major trends influencing the packaging sector worldwide during 2019, including implications for consumers, brands, and manufacturers. “Connected packaging is witnessing renewed interest, driven by growth in ownership of connected devices worldwide and advancement in technologies that link packaging to the online world. “Brands have a wealth of options to connect virtually with packaging – from QR codes and other graphic markers to near field communication, radio frequency identification, bluetooth and augmented reality. “Proclamations by brands and converters touting commitment to 100% recyclable materials or packaging being 100% recycled dominate industry headlines. But the reality that few of them have yet to fully consider is how, where, and who will be supplying and recycling these materials. “Though recyclable packaging claims have become common, claims to include recycled content are still rare. Low availability of high-quality recycled plastic and concerns over food safety are hampering the use of recycled material in food and drink. “And while recycling may be second nature to some, inconvenience and confusion surrounding recycling are a barrier for others. With no option to ship packaging waste off-shore and out of sight, we are likely to see fast improvements in recycling facilities. “The rapid development of e-commerce has had more of an impact on the design of packaging globally than anything the industry has experienced in the past several decades. “There are now limitless opportunities for brand marketers to think about the next generation of shelf presence, the ‘hero images’ on retailers’ websites, and the ‘unboxing’ experience. In e-commerce, brands are learning that messaging and branding should be split between the shipping container and the interior of the box – with the latter incorporating elements that give consumers a sense of delight and surprise when opening the parcel. “While most consumers currently prefer to buy groceries in-store instead of online, the convenience of purchasing online will eventually spill over into food, drink, and household products. Only through an established e-commerce packaging strategy can brands design packs for the worst-case distribution scenario. “Marine plastic pollution has become one of the world’s most serious environmental problems, and there is a growing need for different attitudes to the material. New opportunities such as plastic-free aisles, package-free stores and alternative pack materials allow consumers to actively make choices about the plastic that is put out in the world. “But these incentives are not without their own challenges. While plastic-free aisles reflect consumer exhaustion with excess plastic packaging, in reality, few would want to lose the convenience and benefits plastic packaging can bring. “And while the term ‘plastic-free’ may appear to be a simple one, there is no universal definition; even plastic-free packaging often includes plant-based plastics, showing the lack of clarity in the plastic-free call. 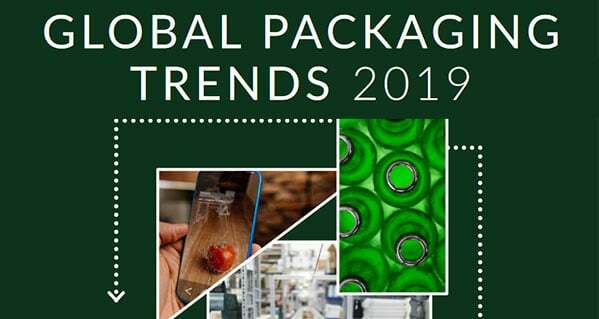 Mintel’s 2019 Global Packaging Trends report is available for free download here.